The bee mortality or colone collapse disorder is the phenomenon of a high decline of bees caused by factors like pesticides, pathogenes (e.g. varroa mites) or the climate change. The bee mortality comes along with massive economical and environmental impacts and in fact, humans cannot live without bees. 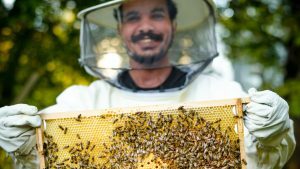 We from Rotaract make aware of these circumstances and at one go support initiatives, like TownBee, that are non-profit organizations building and maintaining urban bee hotels in Munich. Furthermore, we are planning to participate in Workshops like wrapping wildflower seeds, building bee hotels, and getting in touch with beekeepers in cooperation with the Cocoon Hotels and Rotaract Penzberg.